Nuclear option: Harry Reid's attempted filibuster reform. 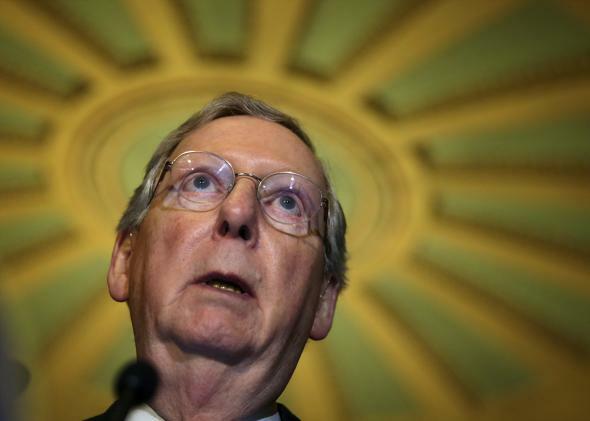 McConnell: Democrats committed the original sin, so we shouldn’t have to pay for it. When Senate Majority Leader Harry Reid took to the floor Thursday, reporters were abuzz about him bringing up the “nuclear option”—getting rid of fillibusters for judicial or executive nominees, except for Supreme Court nominees. But when he got to the floor, he started talking about an entirely more literal nuclear option; specifically, tightening sanctions on Iran. “We must do everything possible to stop Iran from getting nuclear weapons capability,” he said. After finishing, reporters put down their phones in disappointment, but Reid was back on the floor a few minutes later to bring up filibuster reform. “We’ve wasted an unprecedented amount of time on procedural obstruction,” he said. “It’s time to change the Senate before this institution becomes obsolete.” He pointed out that Republicans have rejected four out of five of President Obama’s nominees for the D.C. Circuit Court, while Democrats only rejected two of George W. Bush’s six nominees.